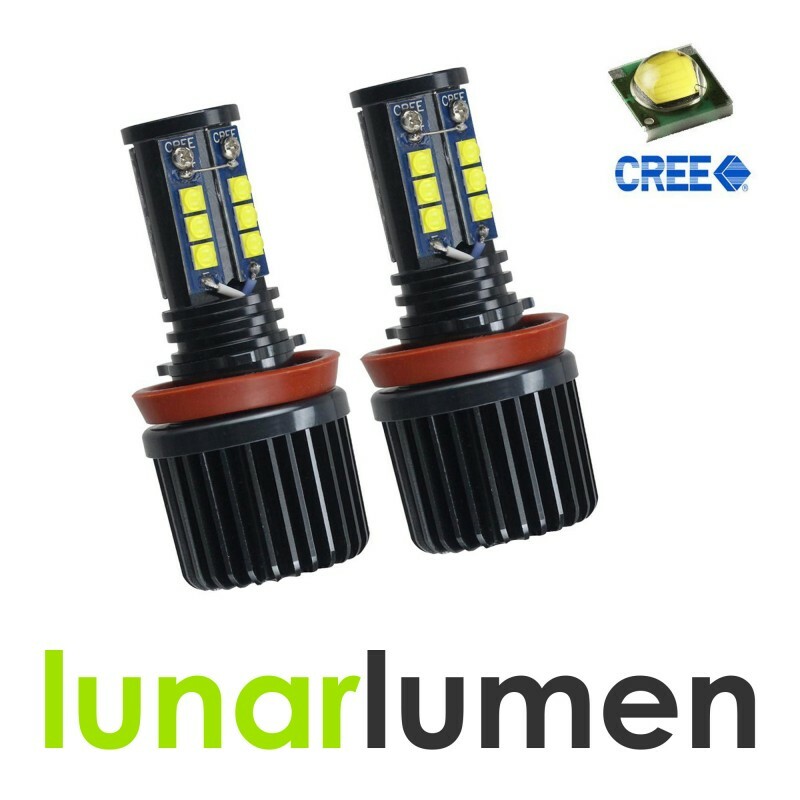 2 x Lunar Lumen H8 BMW Cree LED Bulbs for Angel Eyes. High quality bulbs is perfect replacement for twin rings, much brighter white light than original ones. Each chip power - 5W. 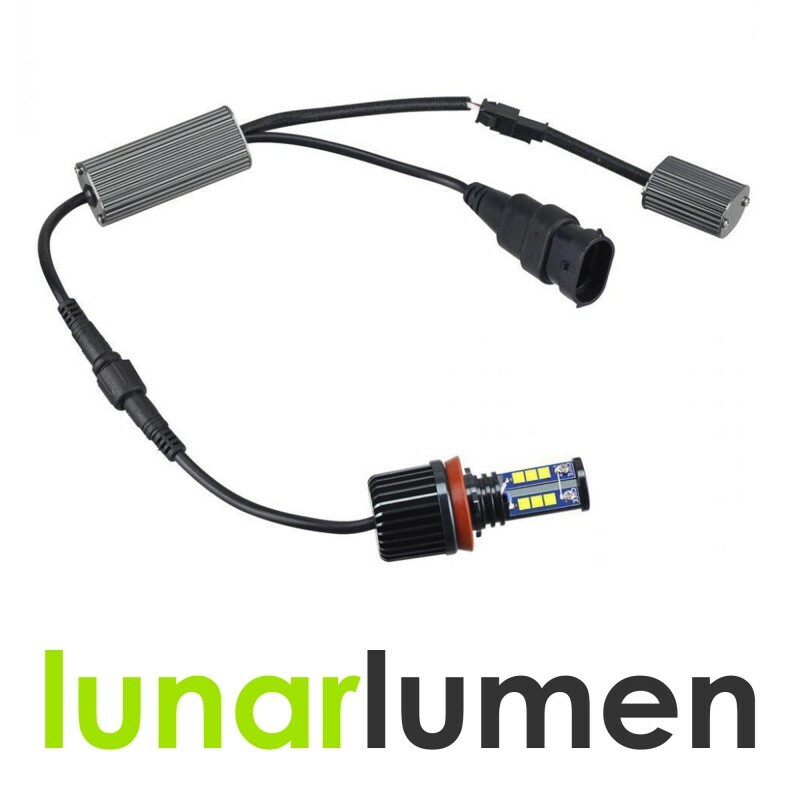 60W per bulb (Total 120W). 6500K Super white color (HID Xenon look). Heat releasing / preventing overheat. OBC Errors free. CANBUS chip. Brightness: 1400 lumens per bulb. No programming needed. Direct replacement. BMW 1-series E82 E87 E88 (2008 - 2012). BMW 3-series E90 sedan Face lifted / LCI (2009 - 2012). BMW 3-series E91 touring Face lifted / LCI (2009 - 2012). BMW 3-series E92 coupe Pre-LCI (2007 - 2013). BMW 3-series E92 M3 (2008 - 2013). BMW 3-series E93 convertible Pre-LCI (2007 - 2013). BMW 5-series E60 sedan Face lifted / LCI (2008 - 2010). BMW 5-series E61 touring Face lifted / LCI (2008 - 2010). BMW 6-series E63/E64 Face lifted / LCI (2008 - 2010). BMW X-series E84 X1 (2010 - 2013). BMW X-series E70 X5 (2007 - 2013). BMW X-series E71 E72 X6 (2008 - 2013). BMW Z-series E89 Z4 (2009 - 2012).